1. Princess gowns - We've been seeing these on all the local photography blogs recently. Lately, lots of brides are going for the sophisticated cinderella type weddig dresses. Now that isn't the puffy, meringue dress of the 90's. Think dresses with gorgeously structured and fitted tops, with flowing, ethereal bottoms. To-die-for. 2. 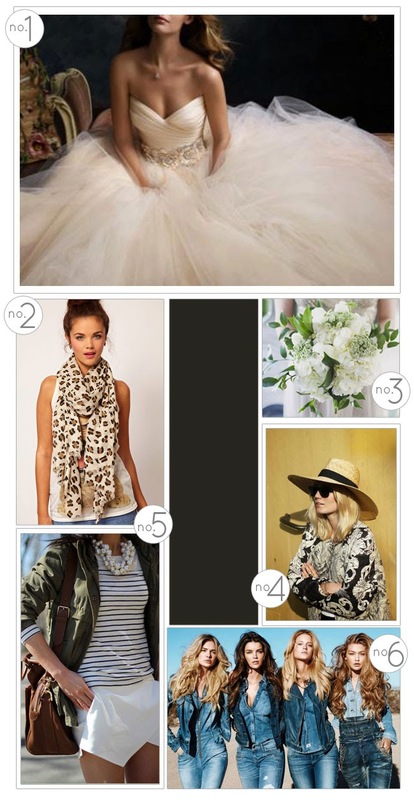 Animal print - This is a trend that just never gets old! And it's perfect to spruce up any dull, boring winter outfit. Add a lovely leopard print scarf or pumps to an all-black outfit and you'll be ready to go. 3. All white wedding bouquets - White is making a come-back in wedding decor in a big way. We absolutely adore an all white bouquet. It's classic, beautiful and will sit pretty with any gorgeous gown. 4. Wide brimmed hats - We have loved seeing this trend all over Pinterest and we're so glad to see it has hit South Africa shores. Sure, a hat may seem over the top, but trust us - it's the best accessory to take your outfit from average to very fashion forward. 5. Military chic - This is all the rage trend-wise this winter. We love the combination of a masculine military jacket and soft feminine touches like this striped top and playful white shorts. These jackets work really well with any tan accessories too. 6. Denim all over - We know some may be hesitant to try this look out because of it's bad rep (thanks Britney and Justin! ), but we love it! Combine a light denim shirt with dark denim jeans and you're sorted!